This is the new CD just released by Ooh La La Creations and I have to say I think it's one of their best so far. 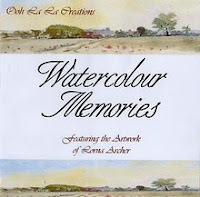 It features the artwork of Lorna Archer and is a wonderful collection of watercolors which includes villages, bridges, farm houses, French chateau, castles, boats and rivers from many of the places that Lorna has visited in England, Ireland, Scotland, Wales and France. 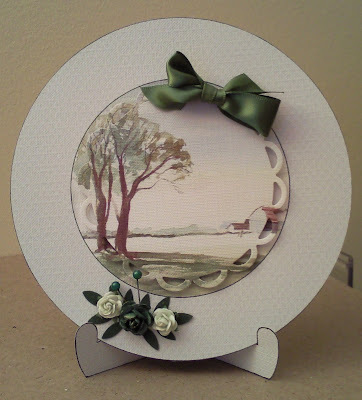 There are some beautiful samples in the Ooh La La Challenge Blog. Why don't you pop over and have a quick peek, you won't be disappointed. I agree with Claire, Anne, it is very elegant and a lovely image. Wow! It's very elegant and beautiful! Sooo beautiful! What a great creation! A very elegant card. Makes me want to find out more about the cd! and your card is so beautiful and elegant. Anne this card is just fabulous - I absolutel love what you have done here - wow wow wow. Beautiful scene and wonderful card!